This Moorea-Maiao resort is on the beach, 2.1 mi (3.5 km) from Tiki Village Cultural Centre, and within 6 mi (10 km) of Tiahura Beach and Le Petit Village. Pihaena Beach and Moorea Tropical Garden are also within 12 mi (20 km). 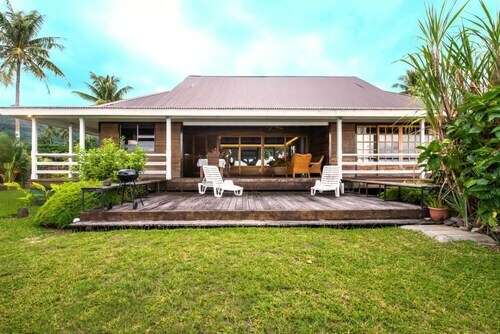 Nestled on the beach, this Moorea-Maiao cabin is within 9 mi (15 km) of Tiki Village Cultural Centre, Tiahura Beach, and Le Petit Village. The Sea Turtles Care Center is 8.1 mi (13 km) away. 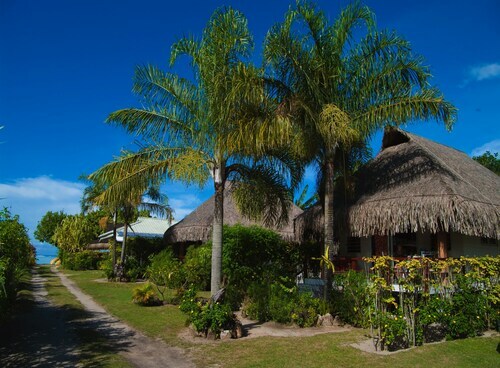 Situated by the ocean, this guesthouse is within 9 mi (15 km) of Tiki Village Cultural Centre, Le Petit Village, and Tiahura Beach. The Sea Turtles Care Center and Mount Tohivea are also within 12 mi (20 km). 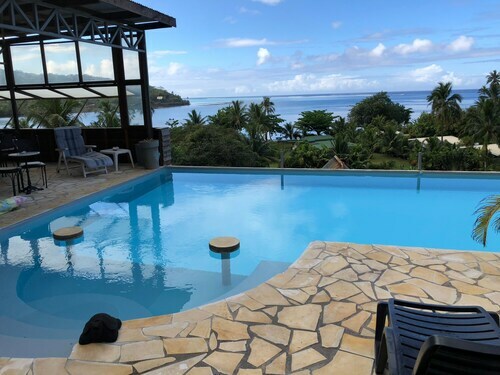 This Moorea-Maiao vacation home is on the beach, 1.7 mi (2.8 km) from Tiki Village Cultural Centre, and within 6 mi (10 km) of Tiahura Beach and Le Petit Village. Pihaena Beach and Moorea Tropical Garden are also within 12 mi (20 km). Wotif travellers in Moorea who are keen to track down a cool place to stay close to Haapiti have heaps of choices. We currently offer around 11 places to stay within a 10-kilometre distance of the town centre. 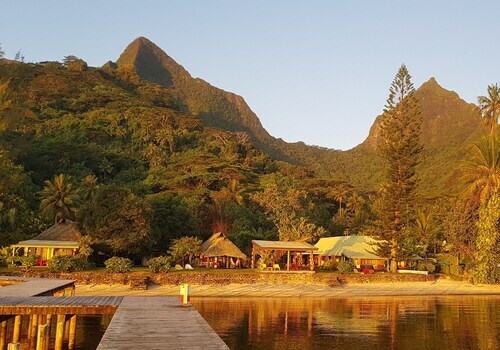 Haapiti isn't renowned as accommodation-central, however, the Linareva Moorea Beach Resort is not far from the CBD and is sure to put a smile on the dial of most travellers. The Moorea Tropical Garden and the Moorea Dolphin Center also have a number of accommodations nearby. The Fare Vaihere and the Hilton Moorea Lagoon Resort and Spa are closest to the Moorea Tropical Garden, while the Hotel Hibiscus and InterContinental Resort and Spa Moorea are close to the Moorea Dolphin Center. 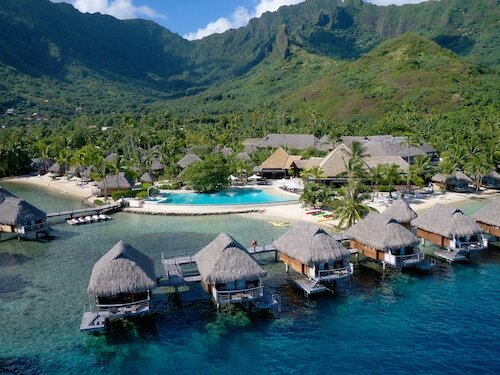 The Sofitel Moorea Ia Ora Beach Resort can be found 14 kilometres from the centre of Haapiti. Alternatively, the Le Meridien Tahiti can be found 30 kilometres away. Some other options in this area are the Manava Suite Resort Tahiti and the InterContinental Resort Tahiti. After you've cruised Haapiti for a while, explore Society Islands' other offerings. Society Islands is blessed with beaches. Popular Society Islands visitor attractions are the traditional villages. Popular activities in this particular part of French Polynesia include mountain climbing, hiking and four-wheel driving. The closest places to spend the night in Moorea include Vai'anae and Pihaena. Vai'anae is 4 kilometres to the southeast of Haapiti, while Pihaena is 8 kilometres to the northeast of Haapiti. 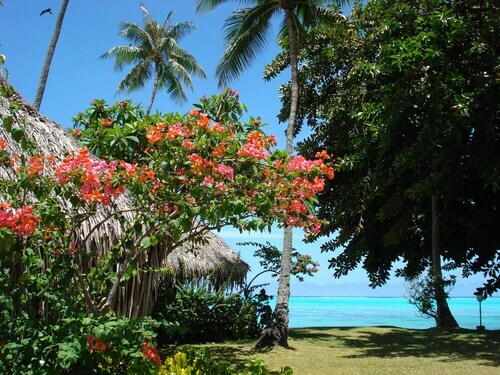 Vai'anae hotels include the Mark's Place Moorea and Moorea Surf Bed and Breakfast. Pihaena apartments and hotels are the Pension Motu Iti and Moorea Pearl Resort & Spa. If sport is a favourite pastime, be sure to visit Stade Pater, which is 35 kilometres to the east of Haapiti. The Hotel Tahiti Nui and the Hotel Tiare Tahiti are both good options if you hope to get amongst it. Temae Airport is the most used airport for flying in and out of Haapiti and is 14 kilometres from the city centre. 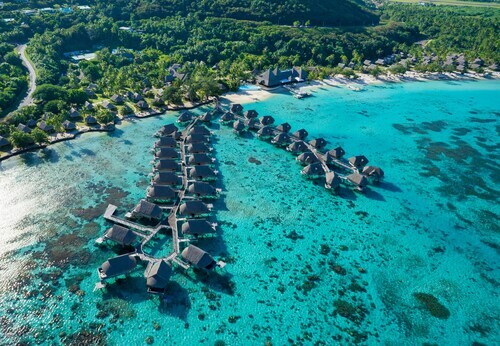 If you choose to stay nearby, try the Sofitel Moorea Ia Ora Beach Resort or the Moorea Pearl Resort & Spa. How Much is a Hotel Room in Haapiti? Hotels in Haapiti start at NZ$170 per night. Prices and availability subject to change. Additional terms may apply. The overwater bungalows were fantastic. Enjoyed KRestaurant. We stayed in an over the water bungalow! It was stunning and worth the money! Just a tip it can get windy so if you want a bit of quiet book and inside row over water bungalow. However if you want to save half the money a beach bungalow is just as good. A disappointing , overpriced hotel. We stayed for a week and we only received toiletries on the third day.No television in the room and the shower head was faulty and wouldn't sit properly on the wall. The only saving grace was the Sunset restaurant which was reasonably priced and the food was excellent.